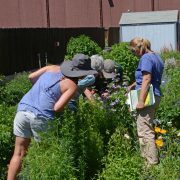 National Pollinator Week 2018 is from June 18-24 and here at Applewood Seed Company we’ve kicked it off by hosting a bee identification seminar for staff and volunteers from the Denver Botanic Gardens. Led by Diane Wilson, Applewood’s staff Ecologist, the training helped the staff and volunteers gain additional experience with bee identification. This will enhance the pollinator observations being done by Denver Botanic Gardens this year. A number of organizations, including Applewood Seed and Denver Botanic Gardens, have been working diligently to promote the health of pollinators critical to our food supply and a healthy ecosystem. Many of these initiatives have pointed out the importance of setting aside natural areas or creating new habitat that provides nesting sites, food and protection for bees. 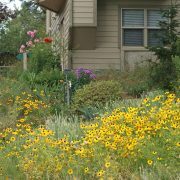 Farmers and urban gardeners are encouraged to grow plants that provide pollen and nectar sources and provide a continuous bloom throughout the growing season. Applewood has a number of pollinator mixes that meet these criteria. In addition, our staff can develop custom mixes for specific areas or growing conditions that continue to meet pollinator needs. Diane has been doing research on pollinator flower preferences in our test gardens since 2009 and is the developer of pollinator friendly flower mixes for general use and also for specific regions of the country. 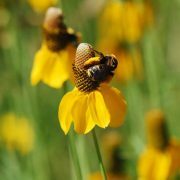 She has also participated on national committees that are continually working on improving pollinator health. In addition, Diane authored A Guide to Colorado Bees, a full-color photographic reference guide for bee identification available from Applewood. Click here to read more about our Pollinator Conservation efforts. 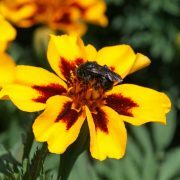 Plant pollinator friendly flowers like the ones shown on our pollinator seed list and register your newly planted flower garden with the Million Pollinator Garden Challenge and ‘bee counted’. 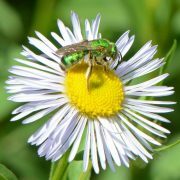 And don’t forget to participate in pollinator week from June 18-24, 2018 by attending any of the various events hosted across the U.S. and Canada which are listed on the Pollinator Partnership website.